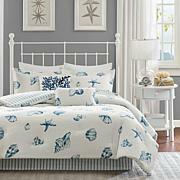 Create a calming oasis in your room with this lovely coverlet set. It features a watercolor floral print across the center that dissipates to solid ivory on the top and bottom. Three decorative pillows add a playful interest to the top of your bed or a side chair.